The Mission of Bon Secours Charity Health System is to provide compassionate, quality healthcare services to those in need, regardless of their ability to pay. If you do not have health insurance we can help. You may qualify for financial assistance through a government-sponsored program or through the Bon Secours Financial Assistance Program. Our staff is available to help you with the application process. The Bon Secours Financial Assistance Program aids uninsured patients who do not qualify for government-sponsored health insurance and cannot afford to pay for their medical care. Insured patients may also qualify for the Bon Secours Financial Assistance Program depending upon family income, family size and medical needs. To view information regarding obtaining health insurance for you child, please CLICK HERE to view our brochure. Bon Secours Charity Health System is committed to being transparent about our charges. 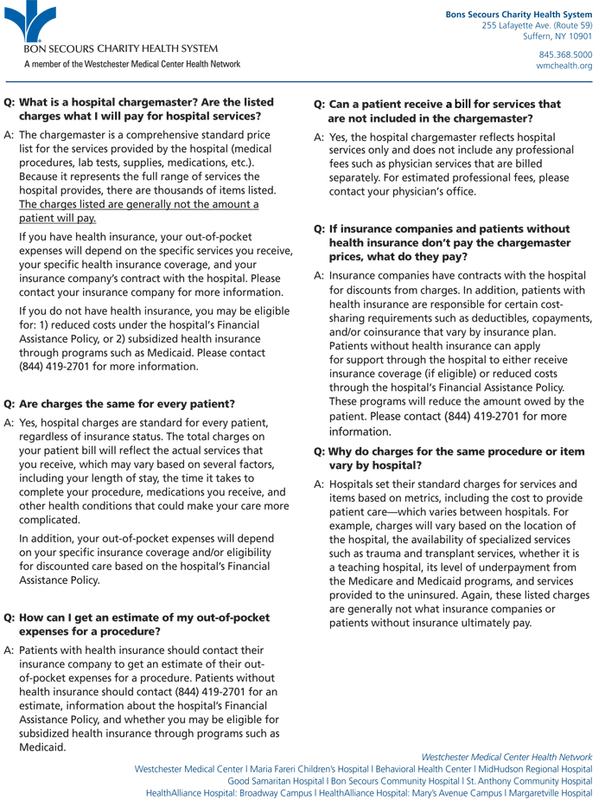 The information on this (DOCUMENT) contains the charges for all services and items provided by the hospital. The charges are uniform for all patients served by the hospital.